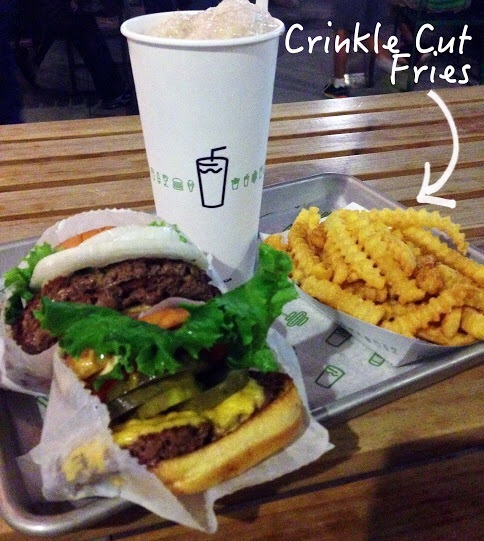 Crinkle-cuts are back at Shake Shack. Cue the tears of joy. Shake Shack's hand-cut, skin-on french fry debacle is finally over. The crinkle-cut has been restored to the menus of every Washington-area Shack. Go on, cry a little. Do your happy dance. You're going to need the exercise. The burger chain's decision to roll out a new french fry this spring -- replacing its old-school, frozen crinkle-cut fry with a fresh, hand-cut version -- was based on fairly sound logic. But the new fry that sounded so promising on the menu was limp in practice; it couldn't hold up to the cheese sauce in the cheese fries. There was no nostalgic elementary-school-cafeteria moment. It was the exact fry that everyone seemed to be doing. And was it just us, or was it soggy? In a hand-wringing press release issued in August, Shake Shack promised to return crinkles to all of its restaurants (this time with fewer artificial ingredients), because so many of its customers had graciously let it know that the company had made a terrible, terrible mistake. "We didn’t fully appreciate the simple, tactile pleasure and the emotional attachment our fans have to the crispiness, the ridges and pure joy that these fries bring to guests of all ages," the statement read. Though the statement said the crispy, salt-bomb crinkles would restored by November, you can already get them at all D.C. locations, including Dupont Circle, Union Station and Tysons Corner. They were rolled out quietly over the past month. Trust us, order them with the cheese.